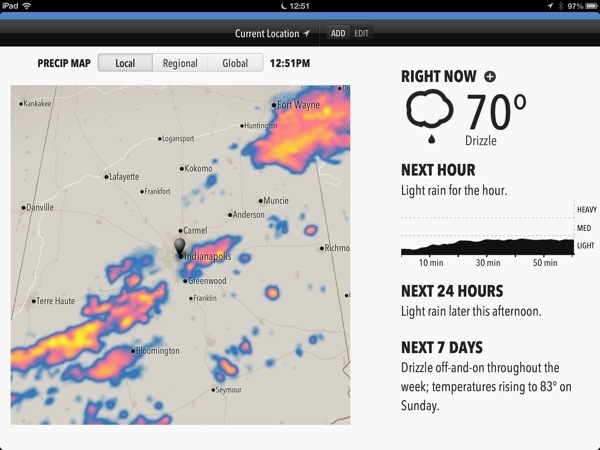 Always on the lookout for cool applications, Forecast.io was recommended to me by a coworker. It’s one of the first HTML5 web applications I’ve used that acts like an installed application. To access the application all you need to do is point your internet browser to http://forecast.io and follow the on-screen instructions (if any). In the case of the iPhone you create a link on your home screen and access that app from there going forward. Visually the application is clean and gives a glimpse of what the new iOS7 will look like when it’s released later this year. From a functionality standpoint it covers all the basics and has a few little twists that I’ve already found useful (like the small chart that shows the timing and intensity of rain in the next hour). It’s worth checking out of you want something different from what you’re currently using. Next Next post: Laptops Fit in Office Envelopes in 1994 Too!